How Much Antioxidants in a Day? Plant foods such as fruits, vegetables and whole grains contain compounds that are beneficial to human health. They include antioxidants that prevent disease-causing oxidative damage that can result from chemical exposure and natural body processes. Antioxidants are found in food as vitamins, minerals, carotenoids, flavonoids, and polyphenols among other phytochemicals. Antioxidants are also available as dietary supplements. While antioxidants have proven beneficial to human health, it is unclear how much antioxidants you need to consume per day to reap the health advantages. When the cells in your body use oxygen, they naturally produce free radicals, or highly reactive molecules. Cigarette smoking, alcohol, metabolism, pollution, direct sunlight, unhealthy foods, exercise and stress can contribute to free radical formation. Free radicals cause damage known as oxidative stress, the precursor to an array of health conditions. Antioxidants act as free radical scavengers, meaning that they donate an electron to neutralize free radicals, thus preventing and repairing oxidative damage. If free radicals are not deactivated, damage to cells and their genetic material can be irreversible. According to the Billings Clinic, there are as many as 4,000 compounds in food that act as antioxidants. Common classifications of antioxidants include vitamins A, C and E, selenium, zinc, carotenoids, flavonoids, phenols, isothiocyanates and sulfides, and the antioxidant-like compounds in coenzyme Q10 and glutathione. Most of these antioxidants are found in fruit and vegetables and are responsible for the vibrant color of foods such as red tomatoes or pomegranate, orange carrots or citrus fruits, green broccoli or spinach, yellow peppers and purple plums or berries. Other foods rich in antioxidants include nuts, seeds, whole grains, fish, soy products, red wine, herbal tea, flaxseed and cinnamon. Antioxidants are most notably recognized for their ability to boost the immune system, enhance your body's natural response to infection, increase antimicrobial and killer cell activities, improve lymphocyte proliferation and prevent the common cold. Medscape Today News reports that there is epidemiological evidence indicating that diets rich in antioxidant-containing food are associated with a lower risk of developing an array of chronic health conditions. Cancer, heart disease, stroke, asthma, ocular disorders, macular degeneration, cataracts, Alzheimer's and Parkinson's disease, rheumatoid arthritis, diabetes, osteoporosis are a some of the chronic conditions that can be positively affected by antioxidants. The Billings Clinic reports that unlike most nutrients, there is no recommended daily amount for antioxidants. There is no established tolerable upper limit for the safety of antioxidant supplements. Current recommendations provided by the United States government and health organizations are to consume a varied diet with at least 5 servings of fruits and vegetables each day and 6 to 11 portions of grains per day, with at least half of these servings being whole grains. 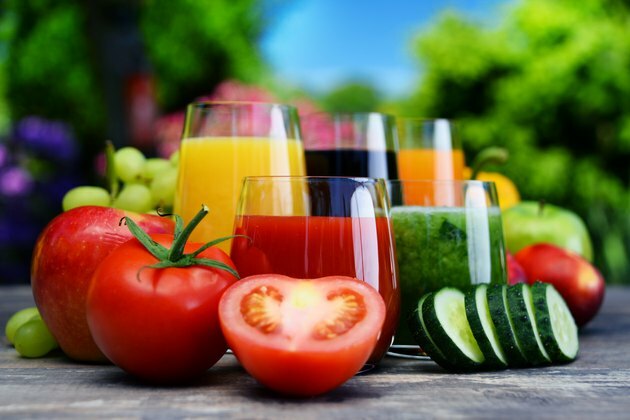 Eating plenty of antioxidant-rich foods and beverages such as fruits, vegetables, whole grains, nuts, seeds, fish, tea and red wine will help you stay healthy and prevent disease. Experts also agree that it is best to obtain antioxidants from eating foods rather than from taking supplements. What Are the Health Benefits of Black Seedless Grapes? Do Antioxidants Help You Lose Weight?